The ultimate de-greasing agent to help your tippet sink and prevent leader flash. 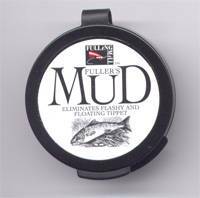 Mixed in-house at Fulling Mill to a unique formula, this is a 'must have' product for any fresh water fly fisher. Counterpart to Gink. Sinks fast. Ideal for nymphs, leaders etc. Coats wet flies & nymphs with a wetting agent that makes them sink quickly. 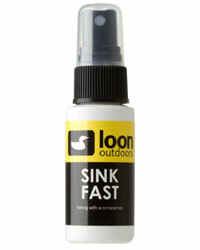 Sink Fast repels water and will actually improve sinking line performance. Designed specifically for sinking and saltwater lines, Sink Fast is a non-toxic, water-based product that cleans, lubricates and protects fly line from the suns damaging rays.  Sinking fly line cleaner.  Spray cap for easy use. Remove cap. Spray on Line Cleaning Tool. Apply to sinking fly line. 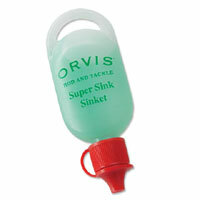 Find the sweet spot quickly with Orvis's fishing line sinker. Get your fly down to where the fish are faster. The special fishing line sinker liquid adds weight to the leader to increase sink rate for nymphs and streamers you want down in the feeding column. Non-toxic tungsten putty sinks your leader fast. Can be rolled into shape and applied to your leader when warm. Hardens in cold water. 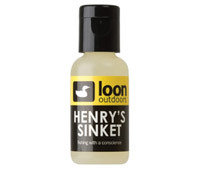 Sinks the leader but not your dry flies. Rub along the first few feet of your tippet. 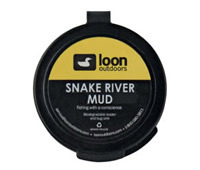 Long lasting Mud keeps the leader out of sight of picky fish.